In France there are not many tapestry weavers who design and weave their own tapestries. I met Katherine Lavocat ten years ago, first in Nontron in Dordogne and then in Aubusson. We were both part of an exhibition, “Aujourd’hui la Tapisserie.”  It was the beginning of long discussions about tapestry. Katherine and I also exhibited together in ARTAPESTRY. I was impressed by her work and also by her career. She has a very particular way of weaving her tapestries, playing with the warp to get vibrations and relief, using hand-spun wool with touches of sisal, silk and nylon, and preparing her own natural dyes. All this makes her tapestries easily recognizable and unique. Mr. Calka’s words express exactly my feelings about Katherine Lavocat and her tapestries. 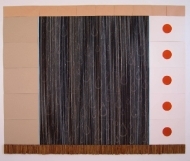 Katherine Lavocat, “Triennal,” 83 in x 79 in, 1992, flax warp, wool, silk and sisal weft. Photo: Katherine Lavocat. In the United States, Katherine’s tapestries can be seen in the Carroll School of Management, Boston College, Boston, Massachusetts; Temple Israel, Weston, Connecticut; Worcester Polytechnic Institute, Worcester, Massachusetts; and Svigal’s Partners, New Haven, Connecticut. Katherine studied at the Ecole Nationale Supérieure des Beaux Arts and Ecole Nationale Supérieure des Arts Décoratifs in Paris, graduating with a degree in mural art. After graduation she began to work in association with sculptor Maurice Calka. For almost 30 years they have created monumental work relating to the architectural landscape and the social and human environment. As multidisciplinary artists with an ongoing concern for the integration, relevance and harmony of art in the city, the sharing of their talents through collaborations came easily. Their experiences in the built field, their practice in disciplines as diverse as sculpture, painting, mosaic, tapestry and stained glass and their knowledge of materials such as stone, concrete, brick, steel and wood, resulted in work with characterized by a sensitive approach to urban spaces and the architecture that characterizes them. When and why did you choose to learn tapestry? What is your background in textiles? My first contact with tapestry, or rather weaving, dates from my childhood in Poland in the 1950s. In the countryside, many peasant homes still housed looms on which women wove cotton fabrics or woolen kilims to cover walls, beds and tables. These kilims, the main wealth and pride of peasant women, constituted a second protective skin against the cold and the signs of poverty. Later, when I was a student at the High School of Fine Arts in Warsaw, in addition to classes in painting, sculpture, composition, and graphics, I also received a short training in weaving. 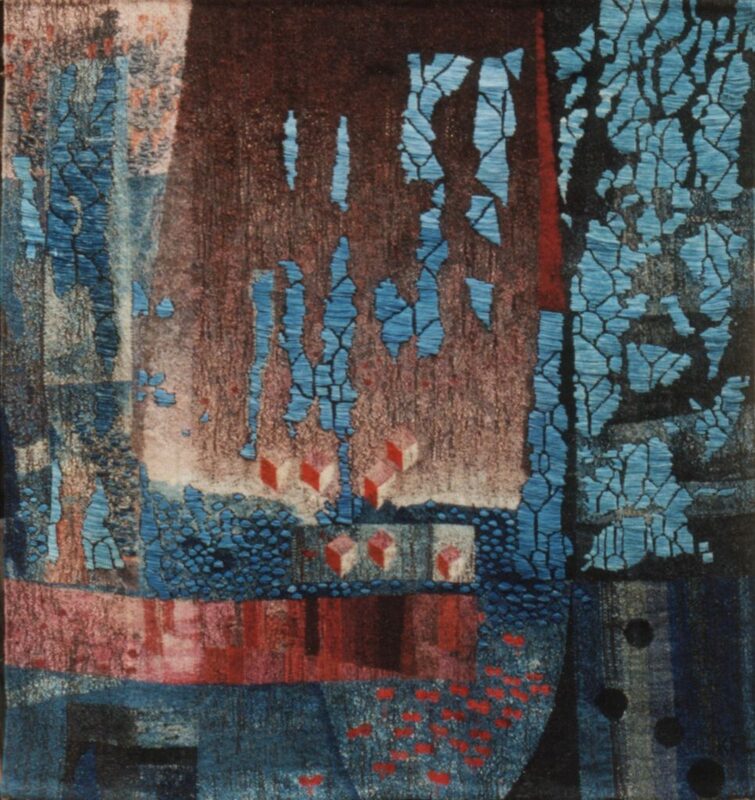 It was in Paris, when I had already started my collaborations with Maurice Calka in the field of monumental art, that I visited the exhibition of contemporary Polish tapestry, presented in the gallery of the Gobelins in 1973. 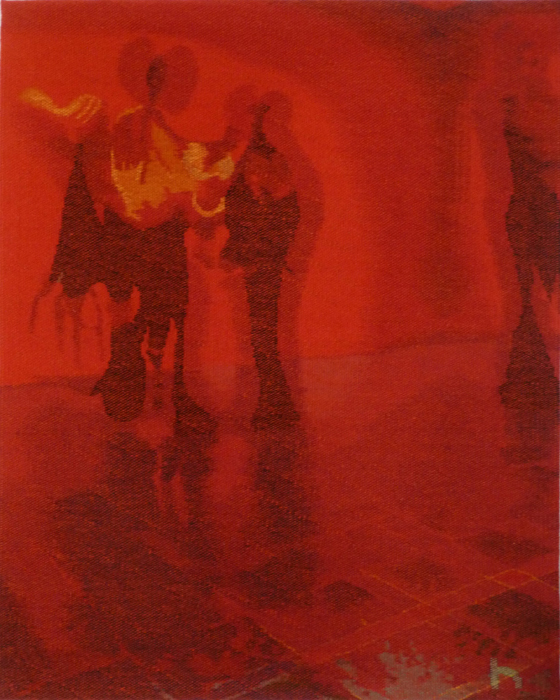 The show included the work of the avant-garde of tapestry – the works of Magdalena Abakanowicz, Jolanta Owidzka and Barbara Falkowska, -which had previously been exhibited in Lausanne. It was a lightning revelation for me. I said to myself, “That’s what I want to do.” Moved by atavism, perhaps, I felt the necessity to create a woven work, to build woolen walls, to sublimate the technique to go beyond the narrow canon, as the work in the Polish tapestry exhibition had done. But, to transcended the canon, it was first necessary to master the traditional techniques. I began by attending a training course with a Gobelin licier. I built my first high-warp loom between the posts supporting the mezzanine of the sculpture workshop where I worked. My teacher, considering me with a certain amusement and skepticism, helped me mount my first warp, made of cotton. Later I had the chance to take classes with Wojciech Sadley at the School of Fine Arts in Warsaw and training in natural dyeing with Barbara Falkowska. I eventually abandoned cotton warp and continued in the traditional Polish manner, on a vertical loom with a linen warp. My weft was hard, long-haired wool coming from the Polish mountains, spun by hand for me. Interestingly, to weave the great tapestries destined for Boston College, I acquired the large loom built for Magdalena Abakanowicz, upon which Jolanta Owidzka had also worked. 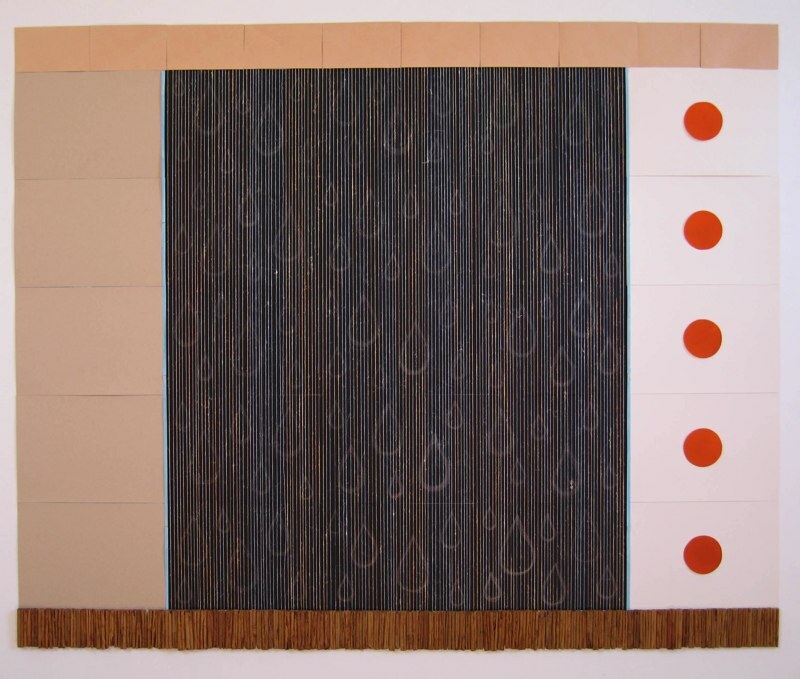 Katherine Lavocat, “Temple Israël-Arche,” 62 in x 125 in, 2004, flax warp, wool and silk weft. Collection of Temple Israël, Westport Connecticut, USA. Photo: Katherine Lavocat. I approach my work as an artist, without referring to theories or claiming anything. My tapestry projects are the fruit of my sensitivity to the world, to the beauty of nature, the joy found in the feel of the wool, the surprise at discovering the colors of the wool when I take them out of the dye bath – the rich, vibrant shades produced by the roots of madder and weld, indigo powder and cochineal. My themes are simple. They may be inspired by landscape, memory, turmoil or a watercolor found in my portfolio. I strive for my tapestries to translate these emotions. I develop my project in color, in a small format, and then I enlarge it on paper to full scale. I slip it under the warp to make it accessible during the weaving. My tapestries are large, rarely less than two meters high, but working on the loom I can only see 35 cm of the tapestry. I use my materials without preconceived idea or plan. I put them together, juxtapose, playing with colors, thickness and density. I pick them as a painter chooses colors on his palette. I improvise. I make choices and consider the process of creating the cloth at every moment, at every square centimeter. It is an intense job. I agree with the idea that artistic solutions cannot be subordinated to technique. However, I use tapestry techniques in the field of tapestry, in the field of stained glass I use the techniques of stained glass. I try to follow the techniques direction and the solutions they propose, but also to go beyond the possibilities they offer and to magnify those possibilities. 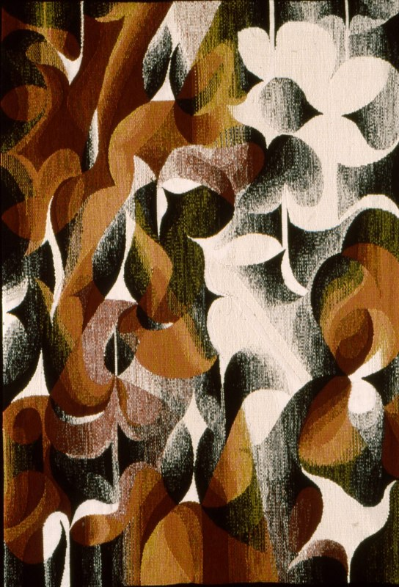 In a tapestry, I seek the richness of the materials and the color. In stained glass, I seek transparency and light. Above all, I defend the idea that any person, with an intimate need to create, to express themselves in any field of art, should be structured by solid training as a visual artist. The need to create can be expressed in different techniques, according to the inspiration, the tastes and the sensibilities of each artist. Techniques are learned, but not ideas. You are a member of the European Tapestry Forum (ETF) Steering Committee. Describe the position of tapestry weavers in Europe. This is a very serious and troubling problem. Fewer and fewer of us create and weave our own tapestries. Tapestry is a work in its own right, it is a wall. Since time immemorial, the builders and architects worked in symbiosis with sculptors, painters, tapestry workshops and other designers. Their works adorned national palaces, public and private buildings and churches. The artists’ and artisans’ contributions to the building were assumed and unequivocal. Since the 1970s, public commissions and the art market have profoundly changed. The art market has absorbed all areas of cultural life. It has become arrogant, speculative, wrapped up with money. Our artistic activity cannot submit to the requirements of a financial economy. We work without counting the time. Tapestry is a choice of life. It is a heroic act, and it must be considered a manifest in the face of the schizophrenia of the present world. 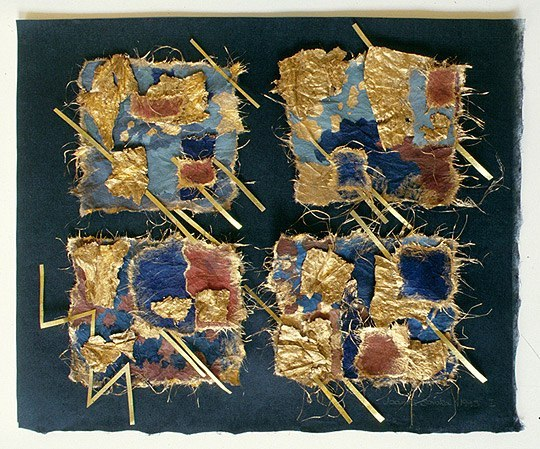 “Mythe Transformé,” 85 in x 79 in, 2005, flax warp, wool and silk weft. Photo: Katherine Lavocat. 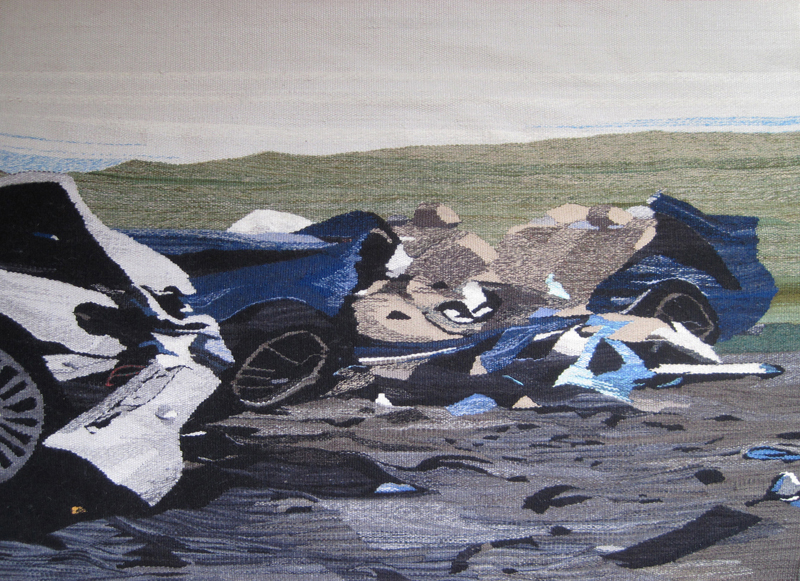 There are not many galleries exhibiting tapestries anymore. Even the European Tapestry Forum, an association that has been proven through the validity and quality of exhibitions organized for over 17 years, is faced with the problem of financing our exhibitions and the difficulty of finding venues to host them. Fortunately, we had the chance to exhibit three of our ARTAPESTRY shows in Angers at the Jean Lurçat Museum, which is dedicated to tapestry. In France, creative artists are confronted with a situation specific to this country. The National Manufactories of the Gobelins, founded by Louis XIV, has dominated the production of tapestry for centuries. It is a respectable and formidable institution. However, it continues to function on the principle of labor established in the factories of the 17th century. The teams of highly trained weavers in the seraglio weave from cartoons, sometimes even from the paintings, of artists who are not initiated into the knowledge or the spirit of the medium. This system of division of labor, cartoon-licier, raised to dogma, has been perpetuated and those who do not follow it are stigmatized. The Gobelins Institution has an important influence on people’s thinking, on the policies concerning the artistic creation of textiles and it captures the bulk of public commissions. Since that time, mistrust of new techniques and the creative spirit has barely changed. What about tapestry weaving in Poland? On the other hand, in the Polish lands, weaving had been practiced for a long time. Fabrics adorned the dwellings of all classes of society, from the palace to the peasant’s cottage. The weaving techniques employed came from different cultures, but the Turco-Persian influences inherited from trade with the Middle East prevailed and the kilim was always favored by the Poles. It was, therefore, the kilim that was subjected to technical and artistic experiments, that was transformed into contemporary tapestry. Indeed, at the end of the 1900s, the enthusiastic propagators of the revival of folk art, inspired by the Art and Craft movement of John Ruskin and William Morris, breathed new life into the art of the kilim. The artists took possession of this medium and transformed it into the art of tapestry. In 1925, during the International Exhibition of Decorative Art in Paris, 307 Polish artists received 172 medals and distinctions. Among the crowned, weaving artists received half the prizes. After the First World War, weaving kilims became a discipline of artistic creation in the same way as painting or sculpture were, and it was widely practiced. Weaving kilims became a symbol of Polish artistic creation and the object of national pride in a country which had just recovered its freedom after 130 years of occupation. 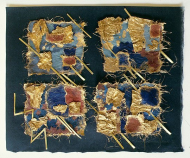 In Poland, tapestry is taught in art colleges. The students follow a five year curriculum, during which they receive the artistic education common to all artistic disciplines. In addition, they takes courses in weaving, dyeing, technology etc. Currently, and in the tradition of the Biennial of Lausanne, Polish tapestry weavers are well known for the richness and the diversity of their works. Whether they live in Poland or abroad they partcipate in all the great international exhibitions. Maurice Calka was a sculptor, premier grand prix de Rome, professor in Ecole Nationale Supérieur des Beaux Arts de Paris. Marie–Thumette Brichard is a French tapestry weaver who lives in Britannia. 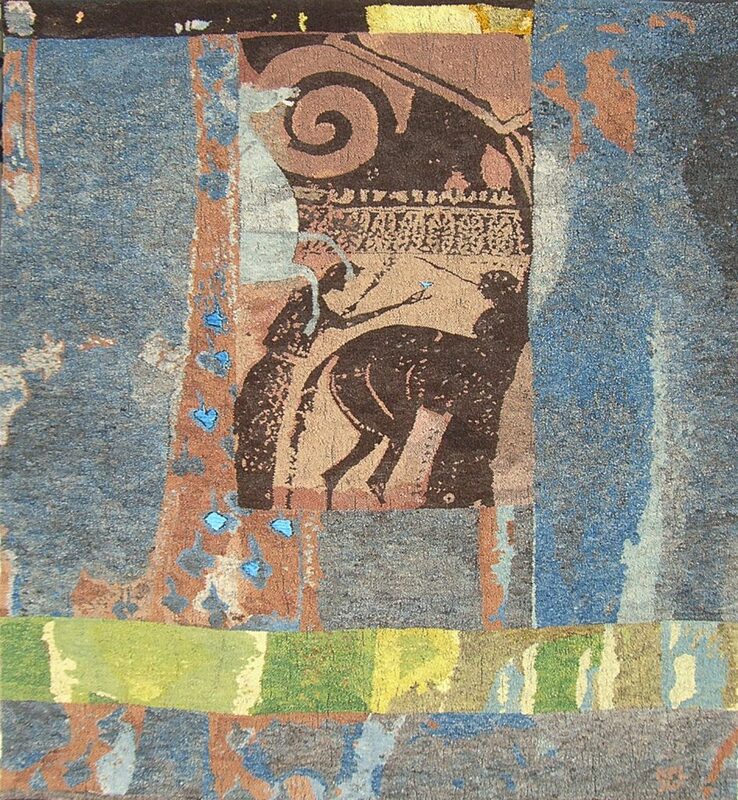 She is a member of American Tapestry Alliance and takes part in many exhibitions, in France and abroad.